HOUSTON, TX–(November 18th, 2014) – MediaFire, a leading provider of consumer online storage solutions, today announced the release of MediaFire for iOS 8, our latest and greatest cloud storage application for iPhone and iPad users. Available today for free on iTunes, MediaFire for iOS 8 adds a variety of new features that make it easier than ever to access, and share all of your files on the go, including new photo and video playback options, a new “Power Upload” mode for faster data syncing, and a new optimized interface designed to take advantage of the extra screen real estate offered by the iPhone Plus. MediaFire’s newest feature, called “Power Upload” allows iOS users to effectively double their upload speeds. The feature can be toggled on and off as needed, in order to quickly and easily upload all of your photos and videos from your iPhone or iPad. Now iOS 8 users can use MediaFire to access, protect, and share all of their mobile photos, videos, automatically. Files are safely stored in the cloud, and can be automatically synced and accessed on your home computer (via MediaFire Desktop), or the web via MediaFire’s online interface. MediaFire Desktop is currently available as a free download for both OSX and Windows users. In addition to paid accounts, MediaFire continues to offer users up to 50 gigs of cloud storage for free. In addition to today’s launch, MediaFire’s complete mobile SDK for iOS has been updated with additional support for iOS 8 devices, enabling developers around the world to easily integrate cloud syncing and storage into their mobile applications. Automatically backup your camera photos! 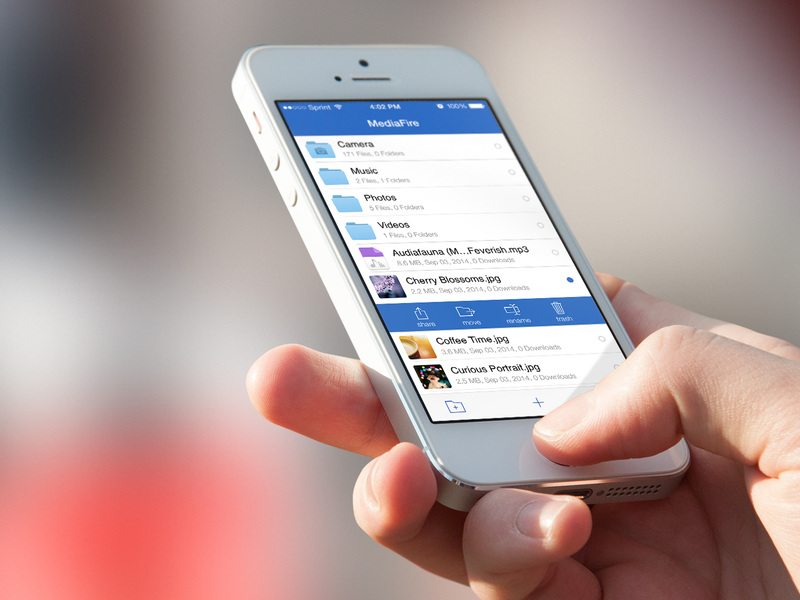 – MediaFire for iOS lets you automatically upload and protect all your photos and videos. Power Upload -A new selectable mode that allows you to harness the full upload speed from your iOS Device. Stream music and videos – Stream your music and video collection anywhere and anytime. MediaFire is an online storage and collaboration company focused on providing regular people with a complete and easy-to-use solution for managing their digital stuff. Available for iPhone, Android, OSX, Windows, and Web, MediaFire is the only online storage solution to offer unlimited downloads, download resuming, zero wait times and more, all for free. Every month, more than 150 million people use MediaFire to quickly and securely store, organize and share all their personal and work data. MediaFire’s API solutions enable developers to quickly and easily integrate cloud storage and file sharing into their applications. For information on how your organization can use MediaFire to enhance your business, visit http://developers.mediafire.com/, or contact developers@mediafire.com for more information.